Pretty in Primal: Epigenetic Orthodontics: Building Better Bites, Faces and Health? Wow, I didn't mean for so much time to elapse since the last post, but I've been putting a lot of time and effort into this one and I'm really enthused to bring you this information. This is a bit of a continuation of the theme presented in my last post. In it, I touched on how pre- and postnatal nutrition affects our dental and facial development. I've recently done some research into the surprising and far-reaching effects of poor jaw development, as well as what can be done once you already have poorly formed facial bone and jaw/dental structure and it's been fascinating. I've included the interviews that I listened to so you can also listen to the pioneers in this innovative field. I'm not going to get into the nutritional aspects of what creates poor development because so many others have already covered that subject. In this post, we will deal with the side effects of poor bone structure and how we can correct it. For a really thorough look into the effects of nutrition on our teeth and facial structure, check out Stephan at Whole Health Source's excellent 9 part series. You can also read Weston Price's classic "Nutrition and Physical Degeneration" online for free. While it might seem like a chiefly cosmetic concern to have crowded teeth or an overbite, it goes so much deeper: a poorly formed maxilla (upper jaw) also affects the eye sockets that support and shape the eyeball (leading to things like astigmatism and near-sighteness), it supports the nasal airways, leading to deviated septums, asymmetrical noses, snoring and sleep apnea (a contributing factor in childhood ADHD, by the way). What if so many sleep issues are really due to our poorly formed airways? The implications are sort of staggering. 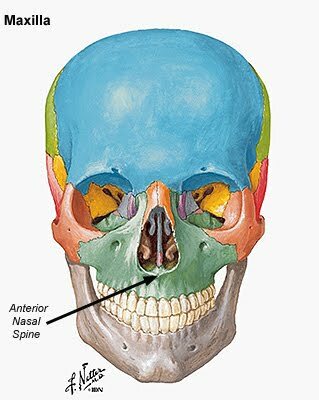 Here's a picture of the facial bone structure. Note how the maxilla (in green) supports the underside of the eye sockets, as well as the floor of the nasal passages. It also forms a good portion of the cheekbones. Do you know anyone with droopy lower eyelids and visible whites under their irises? They have an underdeveloped maxilla. Someone with a nose that leans to one side? One side of their maxilla is less developed than the other. Someone with flat, saggy cheeks? Again, an underdeveloped maxilla. So, what about an underdeveloped lower jaw? Compromised airways and/or a tongue that rests too far back in the mouth from an underdeveloped lower jaw can lead to a forward head posture, which helps to open the airways. However, this can throw off the alignment of the spine (and whole body), leading to headaches, bruxism (teeth grinding), neck/shoulder tension, lower back pain and fatigue, to name just a few things. Also, when your bite doesn't line up properly, the teeth can be subject to uneven patterns of wear. The forward head posture also causes a tendency of the Sympathetic Nervous System to be overactive. You've probably heard of "Fight or Flight"- the state in which you're on high alert and are secreting stress hormones like adrenaline and cortisol. The posture of your neck can keep you in this state (here's an article detailing Fight or Flight and how to deal with it). In an interview I listened to with Dr. Richard Quinttus, who practices Oral Systemic Balance (OSB) therapy, Dr. Quinntus talked about how blocked airways and poor tongue posture can trigger excess adrenaline. He says that many people who feel the need to run to get the famed "runner's high" may actually have high adrenaline and airway issues (the running helps to open their airways and forces them to intake more oxygen), as well as poor sleep quality. When the mandible (lower law) is underdeveloped, TMD can be an issue, as well as headaches. The development of the facial support structure also affects hearing. One of the most striking examples of how a malpositioned temporomandibular joint can affect someone is demonstrated in the work of Dr. Brendan Stack, D.D.S. who has found a remarkable way to treat Tourette's Syndrome by repositioning the jaw! As you can see, it goes so far beyond just the aesthetic aspects. So, what can we do if we have facial structure that didn't exactly develop to its full genetic potential? This is where Epigenetic Orthodontics comes in. Epigenetics: In biology, epigenetics is the study of changes in phenotype (appearance) or gene expression caused by mechanisms other than changes in the underlying DNA sequence, hence the name epi- (Greek: επί- over, above) -genetics. Epigenetic Orthodontics (also called Functional Orthodontics) is a specialized field in dentistry dealing with correcting the narrow palates, poorly aligned bites, facial asymmetries and small jaws that so many of us are afflicted with (it can also deal with crooked teeth). It takes a look at where our development went wrong and looks at the dental structure in the context of the whole face and how it all functions, rather than just looking at whether or not the teeth are straight. The objective is to allow the craniofacial structure to develop in the way they would have, had our gene expression been optimized. Epigenetic Orthodontics stimulates a person’s genes to correct and straighten the teeth without the use of force brackets, affecting craniofacial, dental, and airway structures so that natural developmental processes are evoked by the use of orthodontic appliances. In simpler terms, the appliance makes room by causing new palate and jaw growth and the teeth naturally move into a healthy position. Unlike traditional orthodontics, where the main objective is to simply straighten the teeth at all costs, (how many of you had teeth yanked before you got your braces? ), it addresses the foundational issues. It's like the difference between "flipping" a house by doing cosmetic fixes and doing a real renovation, addressing the structural issues. Other issues with traditional orthodontics are that the teeth often shift and somewhat revert back to their original positions, unless a retainer is worn and the shape of the face and profile can be negatively affected due to extractions and pulling the upper row of teeth back, creating a pinched appearance or a receded chin. Epigenetic Orthodontics uses removable palate expanding retainers, usually worn at night, that use light biological force, making it a much more comfortable process. It's not only more comfortable, it's also safer, as high forces from traditional orthodontic palate wideners can exert unhealthy pressure on the cranial bones (even affecting mental function in children.) There's no way you can put s much pressure on the cranial bones and NOT affect brain signaling. The result of treatment is horizontal bone tissue growth resulting in better facial symmetry, nicer bone structure, healthy orthodontic alignment, better airways and better TMJ alignment. Identical twins. The one on the right received palate expanding treatment and the other did not. Note the drastic difference in facial structure! 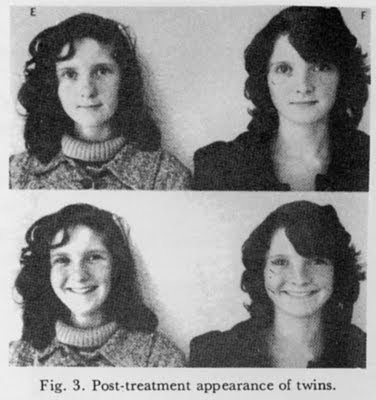 The twin on the right has a much wider face- an example of proper horizontal growth, rather than the vertical facial growth that is so common these days. The pioneer in this still relatively obscure (at least in the U.S.) field is Dr. G. Dave Singh, DDS, creator of the DNA Appliance. You can listen to an interview with Dr. Singh. The DNA Appliance is worn while sleeping and works with the circadian rhythms (night is when most of the body's repair goes on). Another appliance also worn only at night is the Homeoblock appliance, developed by Dr. Theodore Belfor, DDS. This was used in the treatment of the young man pictured at the top of this article (this change is after only 6 months of treatment). You can see that his facial structure became wider- that's what horizontal growth looks like. 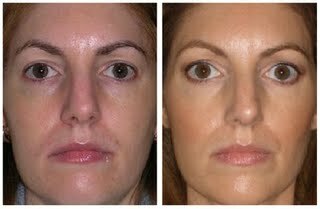 There are some fascinating videos on the website of people's faces morphing from "before" to "after" and some of the facial changes are absolutely amazing. Definitely check them out! There are many skeptics in the dental community claiming that Functional Orthodontics don't actually change the bone structure, but when you look at the cases presented in the Facial Development Newsletter, complete with computer imaging of areas of bone growth and expansion, it's pretty clear that they do indeed change bone structure and increase bone growth. A slightly different type of orthodontic appliance that is less bulky, but worn continuously is Advanced Lightwire Functionals (ALF), developed by Dr. Darick Nordstrom. Dr. Raymond Silkmanm, DDS, who uses ALF appliances, did a fantastic 2 part interview that I highly recommend listening to. Here's Part 1 and Part 2. Early Orthotropic growth guiding treatment during childhood, when development issues first surface, is ideal, but treatment can be done at any point during childhood, usually avoiding the need for braces. There are early signs that parents can look for to determine if their child's jaw and bite are developing improperly. Erin, I think I'll send this off to my orthodontist, who is using the Damon System on me. Damon seems to be achieving some similar results because it also expands the palate. So far, the braces have moved my front teeth further up into the palate, which took away some of the gummy smile that I had. I still see gums, but not quite as much. Also, I know that there was some palate expansion because I suddenly had huge gaps between some teeth. Since there is no room between the teeth to start with, the newfound space is proof of the expansion. So sad all this, however. Dr. Price was right: we were meant to have perfectly formed palates and faces WHEN WE ADHERE TO A NUTRIENT DENSE TRADITIONAL DIET! Sorry for cyber screaming, but that's how frustrating it feels. Thanks for the very interesting post! How about avoidance via long-term breastfeeding? Is that effective? All mine were bfed beyond a year and so far none have needed braces, nor did I, and I was bfed for 9 months (a long time in the 60's) My husband was not even one time bfed and needed major orthodontia, so I do think that bfing helped my children's bites. From what I understand, natural breastfeeding duration ensures a good maxillary (upper) development, but mandibular (lower) jaw can still be too narrow or crowded due to factors such as nutrition and habitual tongue placement. I should add that my oldest 3 are 15, 13 and 13. This is fascinating! I recently went to an Ortho to try and correct an overbite. He said that my teeth were in alignment, and that the real problem was that my lower jaw stopped "growing" and that the only way to fix it would be serious jaw surgery (Where they break it and reset it). Hearing that broke my heart. I had a very similar experience. My dentist said I was just made that way and recommend the jaw surgery you mentioned. I left in tears. It's sad but someone comforting to see there is a greater explanation and possibly alternative treatment. Did you consult with anyone after this finding? Did you try any treatment? Exteneded breastfeeding definitely helps , but it doesn't necessarily prevent poor development (I was breastfed for a year and a half). A lot of it has to do with preconception and prenatal nutrition (and existing deficiencies), as well as the foods the child is eating as they develop (again, I ate whole "healthy" foods as a child, but grains do not agree with me and I have a gluten intolerance, so that likely affected growth). We also have to remember that our soil is MUCH more nutrient depleted than it was a century ago, so it takes extra effort to get the nutrients needed. Bone broths, rich in gelatin and collagen are important, too, as well as organ meats! How do I find one of these practitioners? I think I could seriously benefit from this! I never needed braces, but do have the difference in nostril/sinus size and TMJD on one side. Unbelievable - thanks so much for this! I recently put 1750 down on an upper and lower expander to help correct a crossbite. My real concern is my narrow jaw. I feel like I might have made a poor descision. Was homeowners block a better choice? Can this be achieved with a regular expander!? ckwst, I can't really comment on your particular expander. It it a rapid palatal expander? Does it stay in? The DNA appliance sounds great but have you seen how much it costs? Yes, it's around 8k (that's total cost for upper and lower retainers, I believe). I think the Homeoblock is less expensive. I don't know how much the ALF runs. I had looked into lingual (back of the teeth) braces a few years ago and it was going to be about 9k for both rows of teeth! ckwrst- do you know the name of your expander? It sounds like your jaw needs expansion anyway and possibly the crossbite could be fixed later with braces? You could contact a Homeoblock dentist and ask about crossbites. This is where it is at for sure..I am 38 and I have to play soccer, run and really feel it to breath..narrow jaw with cross bite..when I move my bite over to the left my airways open and I feel so peaceful, but I am not able to always consciously do that...I had a lot of allergies as a kid and mouth breathed apparently. Is there anyone in Southern California that follows this "whole" approach? back when the world was throwing me money I flew to Minnesota to have something similar with removal expanders by Dr. Truax and his expanders but...the travel was too far and needed to be too often so I didn't follow through with it. SOUTHERN CALIFORNIA? Dr. Arnold Valdez, Homeoblock treatment, Claremont, CA. Scratch that just found the lists on the product links above..
Wow, your kids definitely have a great advantage there! And I think for a lot of us intolerant folks, grains are where our teeth really start to go wrong (due to all the antinutrients). There's also the issue of children's mouth posture and thumb sucking, which can result in vertical rather than horizontal growth (Orthotropics corrects this). Firstly, the only difference that I can tell between functional orthodontics and the dna appliance (epigenetic orthodontics) is that patients are asked to wear the dna appliance fewer hours. Supposedly this invokes some kind of circadian rhythym or growth factor and helps the skeleton grow. This is pure conjecture. 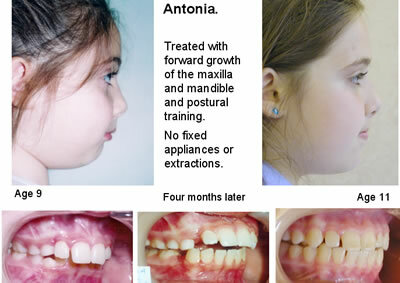 All palatal expansion appliances, whether they are fixed or removable, rapid or slow produce very similar results. While some studies have shown alveolar expansion (the bone around the teeth)in adults, I have not been able to find a study showing expansion of the mid palatal suture in adults. One study looked for this and the only expansion was dental-alveolar. No magic stimulus at the suture has ever been demonstrated, no change in our epigenome has ever been demonstrated. Again, pure conjecture. No change in the skeleton has been measured with either dna appliances or functional appliances. I read a comment from a PhD in epigenetics and genomics who stated that the epigenetics and orthodontic treatment are completely unrelated and that perveyors of this treatment were ripping people off. The upper dna appliance is nearly identical to what is known as Schwarz/Sagittal Active Plate and this has been around for at least 50 years. This appliance might cost someone about 4-500 dollars. You could get this and wear it fewer hours....and presto....it's a dna appliance!! You just saved $7500!!! Remember, I am talking about adults when I say no change in the underlying skeleton occurs with palatal expansion. Teeth are tipping outwards. Any university trained orthodontic specialist knows this. I am aware that devices such as these have been employed for a long time in the UK and Europe. They are lesser known in the US. If someone truly can get similar results from a Schwartz active plate, then that would be great! Their mandible would still need addressing, though. I believe the term "epigenetic" in this instance relates more to mimicking the development that would have occurred, had the genes been exposed to proper epigenetic influence (via diet, mainly)- not to actually affecting the genes themselves (regardless of what Dr. Singh speculates). Dr. Belfor has quite a bit of digital imaging studies that he has published (and likely more he can provide you with, if you inquire) that show changes through the midface bone structure of adults. Published imaging studies I have been able to find, (none are published in the refereed literature) merely look at case studies. The analyzed results were subjective. Case studies only provide a mere glimmer into what may really be happening. I would be very careful about embarking upon such a plan. Thankyou for such a wonderfully informative article! It's really helping me join the dots so to speak so I'm finding that quite exciting. I found your post very interesting and educational. I'll be reading your blog more often, and I will try to share these facts to my friends and relatives. That illustration of the anatomy of the frontal area of the skull is so simple and easy to understand. Did you draw it? I just started treatment with the DNA appliance 3 weeks ago and there is already noticeable changes in my facial structure. My face looks is losing the long narrow shape and is becoming more round. I can breathe better through my nose and my ears opened up on the second day of wear. I am blogging about my experience and will post pictures. I am also eating Paleo. Hi, I've been seeing dr. Stack for my tourettes. Initially, my symptoms went away completly for an entire year, now the appliance has no effect at all. Do you know if the either the DNA Appliance or any other appliance has helped other tourettes patients through jaw expansion? Takamine,I hope you are still checking up on this board. I'm curious what Dr. Stack had to say about why it the splint would have no effect after a year. Did you have to go in for adjustments periodically since the splints wear over time? I just got my DNA... I'll let you know how it goes! Thank you so much Pretty in Primal...it is so rare to get such an informative background on a treatment from a patient's perspective! I too had undiagnosed food allergies growing up and had a constant stuffy nose and became a thumb-sucking mouth breather. My teeth were very crowded and I also had an extemely high, narrow pallet. I wore a bionator (rapid expander) which I cranked every 2-3 days. Since I HATED wearing it as I was 10 years old I often took it out and double cranked it right before my ortho appointments showing up with loose teeth and a headache. It was large, cumbersome and painful. It did give my teeth some room, but I'm not sure how much it widened my pallet. I then had braces which straightened my teeth. I wore headgear on my upper teeth to widen which gave me headaches and loose teeth and seems to have only widened the back teeth, rather then broaden my smile. When my braces were removed I had a "perfect" looking smile. However, I had to wear an upper and lower retainers to maintain this "perfect smile." I have an underdeveloped jaw (slightly recessed) and in order to "fit" my upper and lower bite together my upper teeth were pulled back by the braces and lower jaw brought a bit forward. So, I was left with a beautiful smile, but a tongue thrust so strong that my retainers would hurt and have trouble fitting at if I skipped wearing them for a night (and this is tens years post-braces). After a car accident and a lot of high-impact sports I developed TMD that got increasingly bad over time. I began to wear a TMJ splint on my teeth at night and voiced my concern at not being able to wear my retainers would ruin my teeth alignment. The dentist said not to worry. Yet, after only a few months my upper front teeth began to move forward and after a year I had a major open bite. Right now only my back two teeth touch when I try to close my mouth and my lips never do. In addition, the TMJ splint that helped reduce my pain, has caused gum recession in my front upper teeth because the splint puts more pressure in the front then the back. Although this helps which TMJ pain, it is bad for my front teeth. I also have more difficulty breathing at night because the splint crowds my mouth and gives my tongue nowhere to go. I wake up with a dry burning throat every morning. Additionally I saw one TMJ specialist who said that he has many patients with nasal issues have septum surgery at the beginning of treatment. He said that without the "drag" from inadequate nasal airway opening TMJ symptoms (clenching, tightness) can be reduced and sometimes even high pallets lower without the suction given more space in the nasal area and a more normal upper pallet for the tongue to rest on. Because of chronic health issues:Lymes, food allergies, many physical injuries,etc. I chose to postpone surgery until I was healthier as getting surgery when you are highly inflamed is bad. In the meantime I found my sixth TMJ therapist (centrific relation) which gave me an even larger open bite then my former (neuromuscular) splints. However, this splint has given me the most comfort. My joints have recorticated which is good. I also have had a lot of seriously painful deep tissue medical message to break up scar tissue in my jaw and neck reducing my TMJ pain. Now I only have to wear my splint at night, whereas a year ago I had to wear it 24/7 including eating. Now that my TMJ symptoms as well as my health are improving I am wanting to get an idea of my next step. An orthodontist and surgeon who work with my current TMJ dentist recommended Upper and Lower jaw surgery (Maxillary and Mandibular). The purpose of this surgery is to extend my lower jaw forward and change the angle/reduce height of my upper teeth to close my open bite. This will make my bite even and reduce the pressure off of my back to teeth (the only one's making contact now). 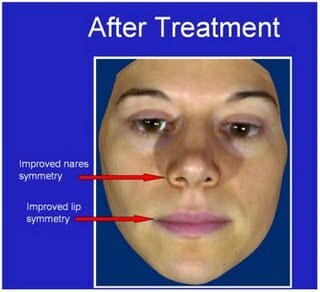 My lips should then touch reducing gum recession and improve appearance of my slightly recessed chin and long face. I would also be doing upper and lower braces which should straighten my teeth in this new bite and add a touch of width. My concern with this plan is that it will probably add a little width in the teeth, but I don't think it would add width to the pallet or reduce the height of the pallet. This surgery also doesn't address my nasal airway issues so I might still need the septum surgery. Also, there are many risks in surgery, especially highly sentitive people (over active nervous system) and this is a pretty major surgery. My goals are to :correct my open bite, improve nasal airway so I can be a nose breather, improve throat breathing at night to improve sleep (I feel like I am often in the fight or flight response Dr Farrand Robson addresses), reduce gum recession. I would prefer to avoid surgery if possible, but am willing to do surgery if that is my best/only option. In order to do surgery I want someone who understands my full and complicated issue. The two surgeons I met with didn't seem to understand how my nasal breathing could have any effect on my TMJ, sleep etc. One said to "use nasal spray." Although that can reduce inflammation, it doesn't enlarge bone structure. The ENT I saw said that both septum's were so tiny he had to use a child scope. So, I am considering talking with a local dentist about DNA. In an ideal world I could do DNA to widen pallet, enlarge pallet allowing more tongue room to reduce thrust on upper front teeth, flatten pallet to give my nasal passage more room, lengthen my mandible and reduce teeth crowding. Then I could finish with braces if necessary. If not, then a surgical path might be my only option. I would just feel better if I could find someone who can connect all the dots rather then every Dr only understanding half of my case. I would appreciate any information that might help direct me down the right path? Thanks for reading my lengthy dental bio I know I'm a complicated case. I'm in no way qualified to give an opinion on course of treatment, but I definitely think it would be worth talking to a dentist or ortho who specializes in sleep apnea and TMJ issues and uses either the DNA or Homeoblock. I would look for someone who is experienced, as your case sounds like it needs expert care. It would be worth traveling to a good practitioner, even if you have to go see Dr. Belfor (Homeoblock) in NY. Good luck on improving your bite and breathing issues. Which doctor in ottawa performs the DNA procedure? Thanks for sharing your story! I'm glad you're seeing improvements. Hi! I got married 2.5 years ago and my husband has sleep apnea. His breathing would keep me up at night and his sudden stop of it would wake me up startling me when he would gasp for breath. I work for BMS and have seen so many transformation from different doctors that we work with. My husband and I decided that the investment we were making on his mouth was worth it. He received his DNA appliance last December, and for the last 4 months I have slept the best since being married :). I was extremely happy that I no longer would wake up scared that he wasn't breathing and I was sleeping... So from the spouse of someone who wears a DNA appliance so far we are extremely happy customers and truly felt it was an investment into his health. That's fantastic! Sleep apnea is no joke and I really think it's one of the least diagnosed health issues these days. From teenage orthodontics, I have had a premolar extracted on one side and everything shifted back. I have malocclusion, a very asymmetrical face, hollow cheeks(smile lines), and basically everything is this article haha. I want to use either the homeoblock or DNA to open up the space and expand my palate to become healthy and beautiful again. Which appliance is better in your opinion? Thank you so much, this has really haunted me and I just want to get it fixed! People are getting good results with both appliances and they're very similar, so I don't think you can go wrong either way! Wow, thank you for such a fast post! I have just been so cautious because I have gone to several orthodontists/dentists/specialists and none of them seem to be educated on this. This has put me into a depression over the past couple of years and I have been desperatley been looking for something and I think this is it...but I want to be sure before make any decisions. But anyways, I am so glad that I came across this site.Thank you so much. This is actually quite interesting. To be honest, I also have a minor over bite, but it was quickly corrected through regular braces done by my Chandler dentist. I did notice some changes in my facial feature one my teeth was properly aligned. Anyway, thank you for posting this; it was a joy reading this. I look forward to reading more of your future posts. Have a nice day! Pretty in Primal have you ever considered that some of the current options in braces can do exactly the same thing as palate expanding devices? There was another blog post somewhere and extensive discussion on these very same issues and an experienced orthodontist pointed out the simple fact that once you are over the age of 6 the palate will be limited on how far it can be expanded and that braces like Damon can do exactly the same thing as these expanding devices, of course you will also need permanent retainers for life to maintain the expansion gained because without it the palates will slowly work their way back. The DNA device is a great example in advertising and overstating claims of something that has already been around for nearly a century in many different forms, some ortho's will even tell you they can make up a similar device that will do exactly the same thing for several hundreds of the dollars. Spending thousands of dollars on a palate expansion device only to then end up needing braces as well is basically money down the drain. I was born with very bad asthma, mouth breathing and fighting for survival from day one basically and I could not be any more of a prime example of an adult (32) with narrow palates, narrow profile and crowding, this has caused me a whole host of life and health issues for over 15 years. Spent 12 months or more researching all this, was very excited by the possibilities of homeoblock or DNA but the more I read the more I realised without surgery I was going to be limited in what I could achieve and also that some types of braces in this day and age will do exactly the same thing. I skipped the palate expansion and just went straight for braces (Damon). Thankfully these days many orthodontists are more functional and realise they can straighten out teeth without removals and at the same time improve facial profile. I would recommend anyone interested in this to do their research well and simple find an experienced more functional ortho, palate expansion into braces is likely a waste of your time and money. That's great that you got good results with Damon! I've seen many examples of these appliances straightening teeth, so many people wouldn't need additional braces. A lot of people (myself included) don't want braces and would rather have an appliance that they can remove in the daytime. As far as cheaper functional appliances, if people are able to find an orthodontist who can treat them with one- that's a good thing. I've looked at comparisons and, from a layman's viewpoint, I have to say that the DNA and Homeoblock look more complicated than the appliances that have been around for a long time, and DNA, in particular, comes in several versions tailored to specific needs (OSA, for example). Singh GD, Heit T, Preble D. Changes in 3D midfacial parameters after biomimetic oral appliance therapy in adults. J Ind Orthod Soc. 48(2), 104-108, 2014. Singh GD, Heit T, Preble D, Chandrashekhar R. Changes in 3D nasal volume after biomimetic oral appliance therapy in adults. Sleep (Abstract Suppl) 37:A150, 2014. The next paper in this series has been submitted to the World Association of Sleep Medicine. The findings are quite remarkable, but based on strong, scientific principles of Epigenetic orthodontics. Hi The first picture you have of the teenage boy before and after pictures. what was his problem and what did he have done? 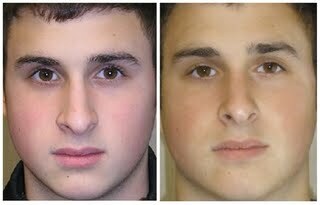 His nose seemed tipped down in 1st picture and second picture facial profile looks much better. I would love to know because my 15 year old boy had upper premolers removed for braces when he was 12 and we are very unhappy with results he looks like the 1st picture of that boy on this page. I appreciate any information you can give me. I am so sorry I had those teeth removed I feel so bad he is not happy with his appearance he now has a drooped nose that he never had before. I am a regular reader of your post.I appreciate with you.Thanks for sharing the blog and always keep it Straight teeth without braces. What about palate expansion in adults to reverse extraction orthodontics? I had 4 bicuspids top and bottom removed in my mid 20's which has resulted in a narrow ugly smile and hollowed face and a tongue that feels like it has nowhere to go. I am so mad at myself for ever agreeing to the removal of teeth. i am now 38 and suffering the consequences. If I do re-open the spaces with palate expansion, I'll have to pay thousands for implants :-( and I can't find an ortho in Montreal who even believes that palate expansion can be achieved in adults. Any advice? Devamtl, I am your age and had my bicuspids removed also. My current dentist keeps showing his disgust with the dentist who removed my teeth. I was in the military so I didn't have the say so in them pulling them, but I too regret that. I got impressions done today for my DNA appliance and should have it in 3 weeks. I specifically asked him today if I would have to have implants or something else when my palate opens up, and he said he did not think so. Pretty in Primal, thank you so much for posting this. I have been reading on this page for the past few days and it has helped with my decision. When I was 14 the dentist removed my lower first molars because he said that I had over crowding. The extractions resulted in my jaws not developing properly and sunken cheeks. You should never let them remove healthy teeth. If I'd known then what I know now I wouldn't let any dentist near my mouth. I am having trouble (in fact no luck) finding othos in the Chicagoland area who work with these appliances. I had 4 permanent teeth pulled and braces (twice) and Invisalign twice. I am an adult and regret getting my teeth pulled when I was 10. I have everything in this article!!! Please someone out there help! Ortho's around here are not even aware of this technology. All very good points to note!!! Looking forward to seeing what is in the baggies! I have an unusual situation in that I have a nicely developed left maxilla and cheekbone (upper jaw), but an underdeveloped mandible (smaller lower jaw) on my left side, which is getting worse over time and creating a bit of TMJ. My entire face is smaller on my left side with narrower palate, smaller eye, but better muscle and skin tone. It looks more child-like. My right side it the complete opposite: I have a larger more “adult” face, larger eye, and larger lower jaw (mandible), but smaller mandible (upper jaw) creating a flattened cheek bone, impacted right canine cuspid tooth. I also for some reason have worse skin and muscle tone on my right side. This pulls my face in all sorts of directions and creates asymmetry in my face, oh my! (By the way, I could only explain in such detail after reading for years on the internet; I would have just simply said before that my face is asymmetrical. ;) I am choosing to have BOTH Homeoblock treatment to expand the palate and underdeveloped bones in my face, AND then have braces to guide the impacted cuspid into alignment. The reason I wanted braces in the first place is because I thought the impacted cuspid was causing some of the asymmetry in my face, but this is not the entire picture apparently, as I have underdevelopment on my left side as well. I asked Dr. Balfour (Homeoblock) if he thought that I should just get braces, and he said that I will not see the facial development and symmetry that I am looking for with just braces alone. He said I may decide to forgo braces, and have the impacted tooth fixed cosmetically, once I achieve more facial symmetry. 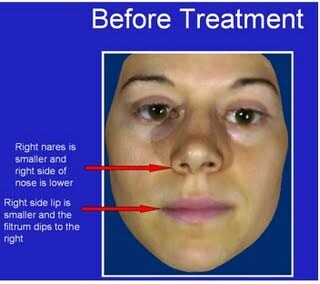 So, it is a tough decision to make, and potentially VERY expensive, but based on before and after photos of Homeoblock patients, I have faith that it is even possible! I spent my entire adult life not thinking there was anything I could do and a bit depressed about the asymmetry of my face (I am now forty years old). Jaw surgery never seemed like a viable option. That said, I was actually a model in my youth, so I was still considered "beautiful" even with an imperfect face! I wish there were a way to post photos here. I will take note to come back to this thread and comment on my progress!